So I've recently been a part of a makeup group on facebook that has a bunch of ladies who have the same makeup obsession and give tips and tricks for different makeup techniques and such. I stumbled across a post which showed one gal who posted about using the soap 'ZOTE' for cleaning makeup brushes. Being the type of person who's willing to try out makeup tips, I decided to go and buy it and try it for myself. I made the mistake of looking in the body wash/soap isle and couldn't find it. I later found out it's actually in the detergent isle and only in Walmart. So I lugged back up to Walmart and finally found it. It was hidden on the very top shelf in a corner. It's a fairly large size, almost as big as my hand, so I found a sandwich size plastic bag to put it in, when I would be done. 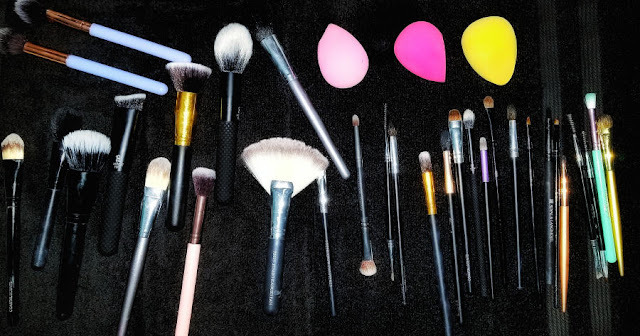 Coming back from my California trip, I had a perfume that cracked and spilled all over my makeup bag so I decided that it was time for my brushes to be cleaned and so nothing gets into my skin that shouldn't be. I bought myself a medium size black towel, a little basket to carry all the brushes, the ZOTE soap, and my pink brush cleaner mitt from Ulta. I actually saw that Walmart also has this mitt but I don't have a link to share because it's not online. Check your local Walmart because you might find the same or similar mitt. I first wet the brush a little bit with regular water. I then went into the Zote soap and swished it around a couple times to pick up the soap and then used the cleaner mitt to thoroughly clean it and then layed it down to dry on the towel. I did this with all the brushes that needed cleaning. (I have around 50 brushes but I didn't clean all of them, just the ones that I used the most and needed to be cleaned.) At first, it was a little difficult because I had to break in the soap but once I got it, the cleaning process was a lot smoother. I can successfully say that the Zote soap cleaned my brushes and beauty blenders very well and they all came out great! Even the little spots on my beauty blenders were gone. I've had some beauty blenders for years and the spots would not budge, no matter how many times I tried, but with the Zote soap, they came off easily and with minimal effort. I recommend this product to anybody who's looking for a good brush cleaner! I left my brushes and beauty blenders to dry overnight on my black medium sized towel and they were in perfect shape the next day. Nothing was shedding or frizzy. The only thing is that the brushes I started at the beginning with were not very clean, but that was my fault because I didn't swish them in the soap as much as I should have. If I had gone back over the first few when I was done, they would have been just as clean. I would still say this soap did a pretty good job. Do you know of any other good brush cleaners? !